The composition is reportedly prevalent with carefully selected natural ingredients. Fresh top notes of Calabria. SIZE: 3.4 oz / 100 ml. All testers are sold unused, with the entire original quantity in the container. Christian Dior Boxed Gift Perfume Set Valentine Love Limited Edition Fast Ship! J'adore dior. 17 oz - 5 ml. Miss Dior Blooming Bouquet . 17oz - 5 ml. Dior Addict . 17 oz - 5 ml. Gift boxed Valentine Love Edition. CHRISTIAN DIOR. EAU DE PARFUM. We are only humans and can make mistakes. Item Condition. Miss Dior Cherie. Christian Dior. Fragrance Type : Eau De Parfum. Size : 3.4 oz / 100 ml. 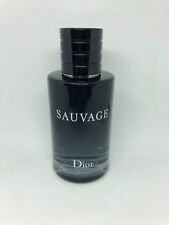 Sauvage Cologne by Christian Dior 6.8.oz.EDT Spray for Men. NEW. Sauvage by Christian Dior Eau de Toilette Spray 6.8. New big size. (our sku:17096). 4.5 out of 5 stars - Sauvage Cologne by Christian Dior 6.8.oz.EDT Spray for Men. NEW. 134 product ratings134 product ratings - Sauvage Cologne by Christian Dior 6.8.oz.EDT Spray for Men. NEW. Christian Dior. E au De Parfum Spray. 100 ml / 3.4 oz. Purse.RED faux patent leather. ~ Dior logo embossed in raised letters on the front. ~ Black plastic lining with CD logo in red and glossy black stars. Factory Sealed. We just want to get a fair chance to work with you to make sure that we have done everything. Trending at $75.00eBay determines this price through a machine learned model of the product's sale prices within the last 90 days. New ListingVintage NWT CHRISTIAN DIOR Pretty Light Pink Skirt Suit size 8 80’s 90’s Rare! Vintage NWT CHRISTIAN DIOR Pretty Light Pink Skirt Suit size 8 80’s 90’s Rare!. Condition is new with tags! A rare find! I have seen this same suit listed for $500 on other sites. Don’t let it get away! Fast shipping, pet and smoke free home Shipped with USPS Priority Mail. Includes : Christian Dior Black Shoulder Clutch. Model : Shoulder Clutch. We are Motor City Pawn Brokers. We look forward to serving you soon! Color: Black. We test and describe each and every single item to the best of our ability. Overall good condition. Worn less than 5 times and stored in dustbag when not in use. Some minor signs of wear to note: -some scratches on the hanging “D” on the front -minor tarnishing on the hardware that adjusts the length of the strap from shoulder to Crossbody -the interior zipper is parting a little on the right side -some marks on the yellow leather on the front. All signs of wear have been photographed to the best of my ability and are at the tail end of the attached photos. Verified authentic by Real Authenticators. Item will require signature upon delivery if purchased by someone with a shipping address within the US. Do not hesitate to reach out with any questions. Discover the new fragrance JOY by Dior. CHRISTIAN DIOR. EAU DE PARFUM. Scent Type Fragrance Family Warm Florals. CHRISTIAN DIOR JADORE. EAU DE PARFUM. New Listing2 Hypnotic Poison by Christian Dior Eau De Toilette Spray 1 OZ. Was made in 1999. There is minor scratches on the EDT spray. These are 97% Full with nobox or overcap. The batch code 9K01 and. Sauvage is inspired by wild, open spaces; blue sky that covers rocky landscapes, hot under the desert sun. The fragrance is announced as radically fresh, raw and noble at the same time. The composition is reportedly prevalent with carefully selected natural ingredients. Fresh top notes of Calabria bergamot encounter ambroxan, obtained from precious ambergris, and its woody trail. Launched in September 2015. Dior Sauvage Cologne by Christian Dior 3.4 oz. EDT Spray for Men Tester. Condition is New. Shipped with USPS First Class Package. Christian Dior. And I will do my best to solve the problem and give you a satisfying answer. DIOR SAUVAGE BY CHRISTIAN DIOR. SAUVAGE by Christian Dior EDP Men Eau de PARFUM 100 ml 3.4 oz NEW IN BOX . Condition is New. Shipped with USPS Priority Mail. Miss Dior Blooming Bouquet By Dior. 100 mL / 3.4 oz. Eau De Toilette / Spray. Trending at $53.48eBay determines this price through a machine learned model of the product's sale prices within the last 90 days. Christian Dior Sauvage Men's EDT Spray 6.8 Oz BRAND NEW IN BOX AND 100%ORIGINAL . Condition is New. Shipped with USPS First Class Package. .34oz/10ml---New Without Box (NWOB). This is a Miniature Eau de Toilette Splash Bottle. Christian Dior Miss Dior 1.7 oz Perfume Gift Box with 2.5 oz lotion. Christian Dior Miss Dior 1.7 oz Perfume Gift Box with lotion.. Condition is New. Shipped with USPS First Class Package. This Christian Dior perfume gift box is being sold well below retail. All reasonable offers will be considered. Christian Dior Lambskin Cannage Medium Lady Dior Light Beige. Condition is New with tags. Shipped with USPS Priority Mail. CHRISTIAN DIOR MINI DIOREVER CROSSBODY SHOULDER BAG Gold GRAINED LEATHER. Shipped with USPS Priority Mail. Christian Dior 3.4oz. 100 ml Eau de Parfum. Original Christian Dior Saddle Bag Navy / Gold Hardware. Dust Bag. No wear or tear, no scratches or marks. Excellent condition. Shipped with USPS Priority Mail. Introduced by Christian Dior in 1998. Hypnotic Poison is classified as a luxurious oriental woody fragrance. SIZE: 3.4 oz / 100 ml. All testers are sold unused, with the entire original quantity in the container. Size: 6 Color: ivory Fabric: 77% cotton, 23% silk Pattern/Embellishments: front center single pleat; scalloped lace tulle floral embroidered hem Sleeves: 3/4 Neckline: n/a Closure: back zipper with hook and eye Lining: ivory 100% silk Additional Info: n/a Measurements: lying flat Bust: 36" Waist: 28" Hips: 38" Shoulder to shoulder: 15" Length in back: 36-1/2" Sleeves: 19-1/2" Condition: Pre-owned- great condition - no stains or damage. This is for a vintage bottle of Christian Dior Diorissimo eau de cologne. 4 fl. oz. Appears to be unused in its original box. Being sold as vintage as is to add to your collection or use. New in a sealed box. Trending at $110.59eBay determines this price through a machine learned model of the product's sale prices within the last 90 days. Vintage NWT CHRISTIAN DIOR Pretty Light Pink Skirt Suit size 8 80’s 90’s Rare! Christian Dior Purple Blouse Size 10 VTG Separates.